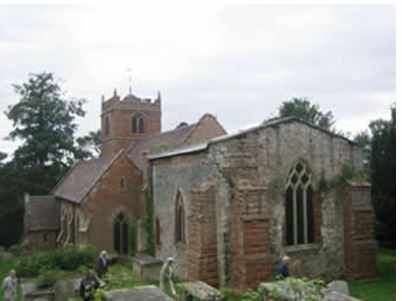 The parish of St Mary Magdalene Quatford is about three miles from the centre of Bridgnorth on the Kidderminster road. The church was founded in 1085 and has some original masonry. It was the original church of the community of Bridgnorth. It has recently been well and carefully restored. The church and churchyard is on a steep hill but a lift has improved accessablility. The churchyard is open for burials. Sheep are regularly brought in from a local farm to keep the grass under control. Quatford Church has had a choir for more years than some of our members care to remember. However, since the development of the Bridgnorth team of churches, over two decades ago, the choir has included members of Oldbury parish, and consequently serves both parishes at Festival times. We also enjoy leading services in surrounding country churches, and often sing at weddings and funerals. For further details or bookings telephone Carol Wall 01746 764365 or 01746 711556, or email tomwall@freeuk.com Interested in joining the choir? Click here! Quatford Church is lovely place to have your wedding - for more details click the link at the bottom of this page.